Is your organization ready to take the plunge into in-house video production? The benefits can be substantial, but making the move requires some preparation. The IT infrastructure you use for enterprise applications might not be able to meet the rigorous requirements of video production. And you might not want video production teams to use resources from your existing infrastructure, since doing so could affect the performance of other applications. 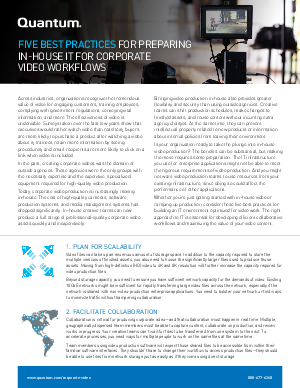 Whether you’re just getting started with in-house video or ramping up production, consider these five best practices for building an IT environment optimized for video work. The right approach to IT is essential for developing efficient collaborative workflows and maximizing the value of your video content.